As with Canine Good Citizen, AKC Urban CGC has a 10-step test of skills that dogs must pass to earn the official AKC Urban CGC title. This is a title that appears on the dog's title record at AKC. 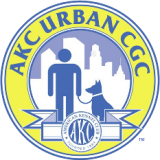 AKC Approved CGC Evaluators administer the AKC Urban CGC test. Get your Test Summary Form here. There is no age limit for dogs taking the AKC Urban CGC test. However, before taking the test, dogs must have a Canine Good Citizen test (either a certificate or title) on record at AKC. Test-giving organizations and individual evaluators may charge a fee for conducting an AKC Urban CGC test. Fees are used to cover the costs of test kits, mailing, copying, and advertising related to the test. Private trainers sometimes charge a fee for a testing session that is commensurate with their hourly rate of service. There is a $20.00 processing fee that the dog owner will pay to the AKC for the AKC Urban CGC title. Handlers are not permitted to use food as a reward during the AKC Urban CGC Test. While we recognize that food is an effective reinforcer during training, it should not be used in the test. As with CGC, the purpose of the AKC Urban CGC test is to determine if the dog relates to the owner and if it can be controlled without food during the short duration of the test. Handlers may talk to their dogs and provide praise throughout the test. The test items should be conducted in an urban, city, or town setting where there are streets to cross, noises, sidewalks, etc. Evaluators should encourage the test to be fun. Evaluators may remind handlers to communicate with their dogs. Evaluators should not make the test easier by eliminating test items, nor should they require a higher level of performance than the test requires. Of course, evaluators may choose to teach or practice more advanced skills in their classes. Transportation. Owner's choice depending on transportation needs.